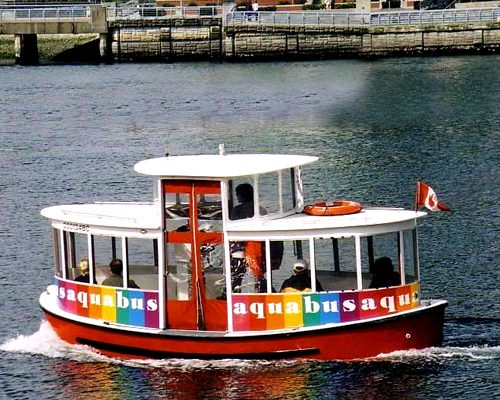 Just look at the brightly-colored Vancouver Aquabus and tell me you wouldn’t like a toy-size version for your bathtub. I mean, it’s so cool. Saturday I hopped on one at Hornby Street to go over to the Public Market on Granville Island (which really isn’t an island, but you know how those Canadians are) and instead of getting off where I was supposed to, I kept riding—down False Creek (which also isn’t a creek; see above) to Yaletown and all the way to Plaza of Nations and then back. And I was still reluctant to get off. In fact, I think if you had a bottle of champagne and some goodies from the Public Market—like maybe a pint of the wild salmon chowder from the Stock Market, a yummy soup emporium—you couldn’t have a more pleasant outing than tooting up and down False Creek aboard a little Aquabus all day. But then you’d miss all the fun at the Public Market, which just absolutely screams Pacific Northwest at you, particularly on a cool, misty, foggy morning when all the Vancouverite moms are tooling around Granville in bright Gore-Tex hoodies, pushing their children—costumed in brilliant red or yellow galoshes—up and down the Public Market aisles in strollers. I’m telling you, I’ve never seen a town so in love with dressing up their kids. They’re just incredibly stylish in their bumble bee toques and pink rain jackets and strawberry-print pants. It’s enough to make you want to have children just so you can have fun accessorizing them. LOL..I read this and was picturing you on the aquabus doing all that…walking through the aisles critiquing childrens styles. LOL..I enjoyed this post..Smiling immensly..we are actually getting snow in Austin..Havent seen snow in 8 yrs…Enjoying watching from the family room windows. You dont realize you miss seeing(I stress seeing) snow till you havent in a long time. Off to sofa watch the snow flakes come down. Snow in Austin! You must be getting the weather that was supposed to hit Vancouver for the Olympics but didn’t! Is there a ski jump in Austin? Is cat fishing an Olympic sport? No ski jump…sad to say it was very short lived, was 67 today and sunny. Vancouver looks like what Ive seen pictures of and heard from friends that live in Oregon and Washington state. Smiles….If it was a sport Fred, every man I know would be entered in it.